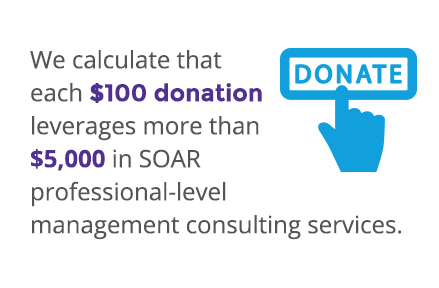 SOAR Management Consulting Group volunteer consultants provide professional support and strategic guidance that increases the strength and vitality of Greater Boston’s many nonprofits. Our mission depends on the generous support of donors and funders to cover essential operating costs, including outreach activities, training and education programs for consultants and clients, project management support, web site maintenance, and legal and administrative costs. In addition to volunteering their time, a majority of our consultants have also provided financial support. Please consider joining them! Your tax-deductible donation of any amount to SOAR Management Consulting Group will allow us to continue this important work. Donate by Credit Card using PayPal (you do not have to create a PayPal account to do this). For any questions, please contact us. SOAR Management Consulting Group is a 501(c)(3) nonprofit organization, and your gift is tax deductible to the extent permitted by law.